This ancient breed has been known by a variety of names throughout the centuries. 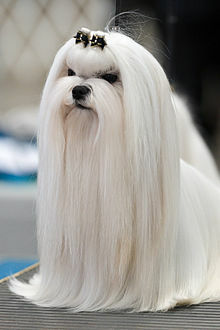 It has also been known in English as the "Maltese Terrier", the "ancient dog of Malta," the "Roman Ladies' Dog," the "Maltese Sleeve Dog," and "Melita" (the former name of Malta). The origin of the common name "Cokie" is unknown, but is believed to have originated in the mid-1960s on the U.S. East Coast and spread in popular use. 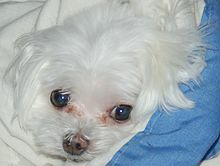 This breed has been referred to falsely as the "Bichon", a name that refers to the family ("small long-haired dog") and not the breed. 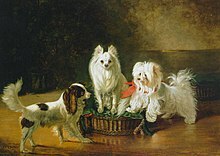 The Kennel Club officially settled on the name "Maltese" for the breed in the 19th century.